Michael Anthony Shanks is a hard working and fun loving Texas musician, singer-songwriter and bandleader whose performances have thrilled audiences from Buenos Aires to Beijing. His unique blend of blues, folk and funky grooves feels immediately familiar yet surprisingly fresh, always taking the listener down the road less traveled . He has performed with numerous world-renowned artists such as Suzanne Vega, Mando Saenz, Duncan Sheik, Jovino Santos Neto, Caretta Bell, and Down North. Born in the wild, worldly sprawl of Houston, Shanks grew up listening to music from all parts of the globe. At home his family would jam the likes of the Doors, CCR and even Beethoven but out in Houston’s thriving arts scene he was introduced to Ravi Shankar, Philip Glass, Joe Guitar Hughes, Astor Piazzolla and countless other internationally known musical innovators. In 2002 he moved to Austin to attend the University of Texas and to hone his skills as a guitarist and songwriter. That’s where Shanks created his first successful projects and cut his teeth as a band leader in Austin’s grittiest of clubs. In 2008 he moved to Buenos Aires, Argentina where he quickly inserted himself into a lively blues scene. After touring as a solo artist in South America and picking up a few Latin licks along the way, Shanks flew back to the States and settled in Seattle. There he performed with amazing musicians such as Jovino Santos Neto and Down North. In 2011 Shanks returned to Houston to find the city’s music scene growing and continuing to inspire. In 2013 his band, the Shanksters, opened for Reverend Peyton’s Big Damn Band at the House of Blues and in 2014 they were back at the HOB performing alongside national touring group Graceland Ninjaz. In 2015 the Shanksters headlined Earth Day Festival at Discovery Green. Shanks also has performed in several Broadway shows including the 2016 run of “A Night with Janis Joplin” with renowned rock singer Kacee Clanton at the Alley Theatre. And most recently he has done two tours in China and Singapore with the show Legally Blonde. In 2018 Michael played guitars, banjo and mandolin in the world premiere of Lover, Beloved with Suzanne Vega and Duncan Sheik. Working with songwriters of Vega’s and Sheik’s stature was a watershed moment of inspiration for him. This year expect to be hearing a lot from Shanks as he plans to release exciting new music in the coming months. Michael was featured in the Houston Press’s Rock’s off 200 blog. Click the picture to read the review. Shirts available! 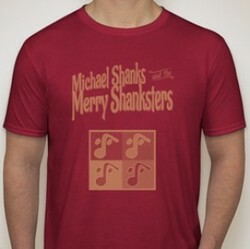 Also get a CD copy of Shankster Style.